Researchers at Harvard University have created a gel-based audio speaker using a thin layer of polyacrylamide polymer as base material. 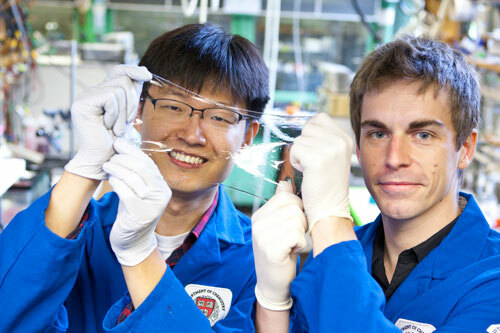 The new gadget is flexible and transparent and could pave the way for a new generation of transparent and flexible gadgets. The speaker is constructed from a polymer layer and uses ions instead of electrons in order to transport electric charge. Jeong-Yun Sun and Christoph Keplinger are the two young researchers involved in the project and they have demonstrated two of the benefits of this technology: transparency and flexibility. The ion based conductors can be easily stretched and are completely transparent, two properties that are not easily found in the gadgets of today. According to the two scientists, the system does not require too much power to work, and it can be embedded anywhere there is a need for a soft and transparent layer that can deform. For example, it can be used in conjunction with the screen of a TV or a laptop to generate a sound when it is touched. Harvard scientists believe that the developed technology could be incorporated into biological devices constructed from a gel that would fit well in the human body. One such gadget could even perform several human tactile and auditive functions. The developed speaker can play sounds at frequencies between 20 Hz and 20 kHz. Christoph Keplinge thinks that all the late findings in biology and mechanics are getting us one step closer towards the era of elastic gadgets.